On the 17th of September 1982, American artist Ettore “Ted” De Grazia died in Tucson, Arizona. 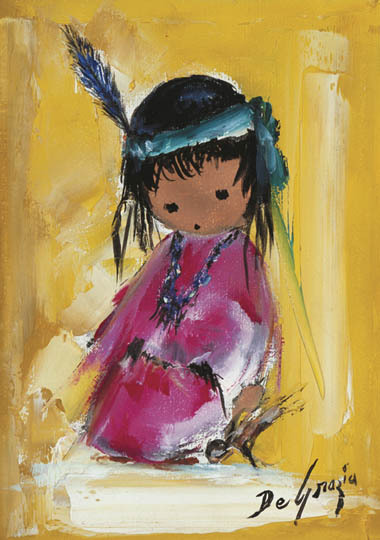 He was an impressionist, western pop painter, sculptor, and lithographer best known for his pastel images of wide-eyed Native American children, which were used by UNICEF as cover art for their greeting cards. De Grazia was born into a family of Italian miners in Morenci, Arizona. However, during his childhood, his family went back to Italy during a downturn in copper prices. They returned to America when the wages increased. Right from his early years De Grazia began to relate to his Mexican neighbours and travel throughout northern Mexico, coming to identify closely with the Mexican and Native American cultures that were reflected in his art. “I like to portray people as they really are,” he once said, “not merely to present a tragic view of life, but to enrich the experience of those who have not really seen the common Mexican people.” (San Pedro Valley News, August 22, 1941). An expression of his strong inclination towards Mexican culture was his famous Gallery in the Sun (constructed between 1951 and 1965) – a series of buildings scattered throughout a natural desert setting – in which De Grazia worked and lived until his death. Presently, the complex serves as a museum of De Grazia’s work. In the archives at the DeGrazia Foundation, there are oral histories from some of the students who were given the Color Music Pattern Test. At first, they could not understand how they were going to be able to see shapes and colors. But the more they listened to the symphonies, the more the shapes and colors took form in their minds. They could literately ‘see the music.’ DeGrazia did a series of abstract paintings based from the results of these psychological, audio, and visual experimental tests. Incredibly, from these results DeGrazia was able to ‘paint’ these symphonies from the information the students had given him. They are abstract wonders of line, shape, and color. This remarkable Master’s Thesis is part of the permanent collection at the Gallery In the Sun. I worked at a large frame store in the mid nineties which had a framing contract with Gallery in the Sun. Sometimes we’d get framed images from them that needed minor repairs. I remember opening the back of one of these which was priced at over 200$ and when I took it out I saw that the ‘print’ had on it’s back side was the month of January.